PORT OF LIPATA, Surigao City— Tropical Depression ‘Zoraida’s’ presence in Mindanao after it made a landfall in Davao Oriental on Tuesday morning, November 12, had indefinitely extended the grounding of several ships bound for Leyte which left hundreds of passengers and dozens of vehicles stuck in this seaport dubbed as “Gateway To Mindanao”. 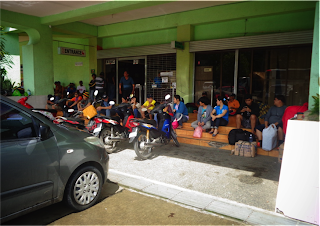 PP/Supt Froilan Caturla, port police commander, said that about 778 passengers and 96 vehicles including 12 buses were stranded at the Port of Lipata. “We’re here to extend assistance to the unfortunate passengers, composed mainly of 707 adults and 39 kids, and we offer our port facility as their virtual refuge vis-à-vis this unpredictable force of nature we are facing,” Caturla said. Port Manager Isidro Butaslac, Jr. of the Philippine Ports Authority had spearheaded a sustained ‘feeding activity’ for the duration of the stranded passengers’ stay in the said port. His initiative was supported by various shipping lines, civic organizations and the Barangay of Lipata headed by Punong Barangay Lucresio “Lolong” Mesias, it was learned. Earlier, the Philippine Coast Guard (PCG) Surigao City Station had advised various shipping lines and their vessels from making any voyage to the Port of Liloan and the Port of Benit in Leyte Province due to Storm Signal No. 1 hoisted by PAGASA covering the province of Surigao del Norte. ‘Zoraida’ is bearing maximum sustained winds of 55 to 65 kilometers per hour near its center and is moving northwest at 30kph.